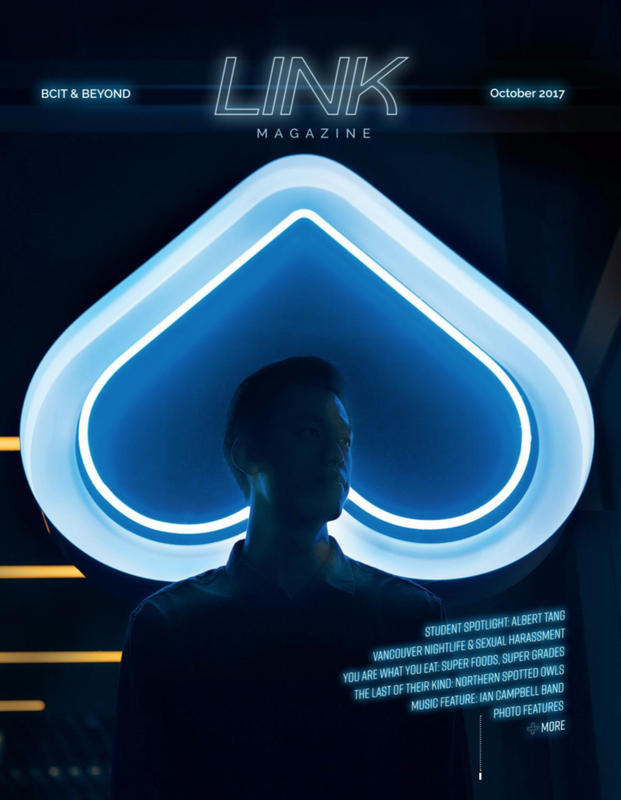 For the October 2017 issue of LINK Magazine, I shot our Student Spotlight for the cover. Our Student Spotlight was Albert Tang. Albert is an Architecture Student and Entrepreneur (among other things, he's also a great photographer). He owns Nemesis Coffee in Gastown with his business partners. I don't really understand how he works part time and goes to BCIT simultaneously, but somehow he does and excels at it. I can only assume he stopped sleeping. Nemesis Coffee has a cool logo of an upside down heart, and outside the cafe they have a large glowing, neon sign of their logo. We wanted to utilize this for the cover. I met Albert after hoursand we took some photos around Nemesis. I wanted to capture the blue glow of the sign, and showcase the graphically interesting sign.